The Native American philosophy behind the vision of the Medicine Wheel is that all things and beings on the earth are related and, therefore, must be in harmony for the earth to be balanced. Dancing with the Wheel teaches you how to apply this philosophy to your daily life through many practical exercises and ceremonies. These exercises will help you gain energy from the spirits, which can heal both humans and the earth. To enjoy dancing with the wheel you must first learn the steps to the dance. Like most earth-based ceremonies and tools, the Medicine Wheel appears to be simple. After all, it is merely a structure of thirty-six stones. Yet there are untold levels of meaning to this simple circle and the lines within the circle. Dancing with the Wheel is a step-by-step guide to these levels. To understand the Medicine Wheel dance you must first know that the Medicine Wheel of this vision is similar to the 20,000 Medicine Wheels that existed on this continent before the European people immigrated here. These Medicine Wheels served many purposes for the Native people of the Americas. They were the ceremonial centers of culture, astronomical laboratories, and places people would come to mark the times and changes in their own lives as well as the life of the earth. They were places to pray, meditate, contemplate, strengthen your connection with nature, and come to a higher degree of understanding of yourself and your relationship with all the creation. Medicine Wheels were usually placed on areas where the energy of the earth could be strongly felt, and their use in ceremony made this energy get even stronger. Consequently, Medicine Wheel areas became what people now call vortexes: places of intense earth energy and healing. The new areas where Medicine Wheels have been built are serving the same function. Forms of the Medicine Wheel exist all around the globe from the great stone circles of Europe to the mandalas of India. Ali of these are reminders of our past when the world was guided by the law of right relationship. and humans respected themselves and all their relations -- mineral, plant, animal, spirit -- on the Earth Mother. Learning about the Medicine Wheel can help you remember your connection with all these aspects of the universe. Each stone in the Medicine Wheel is a tool to help you understand your ties with the ancient past that molds both personal and planetary present and future. Each position in the Medicine Wheel will directly affect you at some point in your life. The Creator stone, or symbol, is the center of the Medicine Wheel as the Creator is the center of all life, always creating without beginning or ending, always moving, always continuing. From this center radiates the energy that creates all the rest of the wheel. The seven stones that surround the Creator form the Center Circle of the wheel and represent the foundation of all life. Slightly to the south of East is the stone that represents the Earth Mother, the being who gives us our home and our lives. Continuing in a sunwise (clockwise) direction -- as we almost always do in building and using the Medicine Wheel -- is the stone honoring Father Sun who warms and quickens life. Next comes the stone for Grandmother Moon who guides our dreams and visions, followed by the Turtle clan stone, representing the element of earth; the Frog clan, representing the element of water; the Thunderbird clan, representing the element of fire; and the Butterfly clan representing the element of air. These seven stones teach about the basic building blocks of all life. The anchor stones for the outer circle of the Medicine Wheel are the four stones honoring the Spirit Keepers: Waboose in the North; Wabun in the East; Shawnodese in the South; Mudjekeewis in the West. These Spirit Keeper stones divide the circle into the quadrants that set the boundaries for the twelve moon stones in the outer circle. These stones represent the moons that divide the year. From them we learn more about each season; each time of day and time of life; and each mineral, plant, animal, elemental clan, Spirit Keeper, and human associated with that moon. Completing the Medicine Wheel are four Spirit Paths, each consisting of three stones. These paths go from the Spirit Keeper stones toward the Center Circle. They represent qualities that take us from daily life into the sacred space of the Creator. That simple physical description of the Medicine Wheel provides you with the first basic steps for dancing with the wheel. But to really understand the wheel, your comprehension must surpass the physical and the intellectual. You can never dance well if you are always thinking about where to place your feet. To dance you need to listen to the music and allow that music to be a part of your body and being. That takes time and practice. When you are ready to begin, use the following simple technique, the first of many that will help you dance with the wheel. Throughout the book, these techniques are called visualizations or an exercise. These provide ways for you to mentally see, feel, and imagine yourself and your life as something different from what it is now. All visualizations and exercises, if treated with respect, can be done as ceremonies that are ways for you to connect your energy with the energy of the universe and to thank the universe, and all of its parts, for the gift of life. What you need. A quiet space and, if desired, notebook and pen or tape recorder. Estimated time. Ten minutes at first, five when you have done this visualization a few times. 1. Sit comfortably in a chair, or on the floor, or lie down. Take a few really deep breaths, allowing your breath to go through as much of your body as it can. 2. Close your eyes. Relax your jaw and stomach. 3. Be aware that the earth is beneath you even if you are on the fiftieth floor of a skyscraper. Feel your energy connecting with the energy of the earth. 4. When you are relaxed and feel connected, just listen. 5. Do you hear something? Faintly at first then louder you will hear a beat that sounds like a drum. 6. What is it? Listen closer. Tum, tum, tum, tum. The drumbeat you hear first is the beat of your own heart. Listen longer. 7. Tum...tum...tum...tum...goes a slower drumbeat. You feel your heart slow to beat with this new music and you feel yourself deeply relaxed, deeply connected to the source of this music: the Earth Mother. 8. Enjoy the music, enjoy the few moments in sacred space. 9. When you are ready, come back to your normal reality. 10. Take a moment to feel any differences in your body, to sense changes in your perception. 11. If you wish, write down or record your reactions. Hearing the Earth's song can give you a whole new understanding of the Medicine Wheel because when you become aware of this music you begin to understand the law of relationship: Each of us is deeply connected to everything that exists, each of us is a critical part of the sacred Medicine Wheel of life. The law of relationship is a natural law, a real law that is absolutely critical to these times when we have lost our sense of balance, our sense of connectedness with all that is life. The Medicine Wheel can help you regain some of what you have lost. The Medicine Wheel will help you understand your real relationship with all of the beings on the earth: the elements, the plants, the animals, the humans, the spirits. These beings can teach you about many other layers of the wheel. In The Medicine Wheel book we introduced you to the mineral, plant, and animal totems for the twelve stones representing the times of the year. In Dancing with the Wheel we introduce you to the totems for all the positions of the wheel and tell you what each totem has to teach you about life and about relationship. As you learn the steps of this dance and hear the music more clearly, you may desire ways to honor your new relationship with life. Through respect for the correct use of ceremony you will find them. Ceremony that brings you into a deeper relationship with the earth is an important part of the Medicine Wheel. So are exercises and visualizations to help you gain a personal understanding of all the elements of the wheel. You will find such exercises throughout the book. After you have learned about ceremony and the different individual aspects of the wheel it is likely some of you will want to build a wheel so you can experience its energy. In The Medicine Wheel we gave basic instructions for building a wheel; in this book we will give more detailed instructions for building a basic Medicine Wheel, and we will tell you how to build various kinds of Medicine Wheels: ones to experience specific mineral energies, to honor trees, to honor the element of fire, and one you can use when traveling. When you have explored these aspects of the Medicine Wheel you will be ready to experience how the wheel can teach you about your own life. Although you have a basic position upon the wheel determined by your time of birth, you do not remain in that one position for your entire life. Everyone travels around the Medicine Wheel, experiencing life from as many of the positions as possible. This means it is likely that at various times you will act, think, and feel like a person born under one or all of the other eleven moon positions. Being able to discern your movement, to know which positions are influencing you at a given time, will help you understand yourself and another layer of the wheel. Experiencing other positions on the Medicine Wheel is not strictly a matter of chance. It is possible for you to move purposely to another position when you need to understand the life lessons that position represents. Throughout the book we encourage you to seek a certain stone if you are striving to balance yourself in a particular way. This is because each stone represents many layers of life. Being near a particular Medicine Wheel stone, either physically or in imagination, can help bring balance to different aspects of your being. In your movement around the wheel you are likely to experience times when the element of change affects you more than anything else. These are times when you are under the influence of the thirteenth moon, the invisible moon missing from our calendar-oriented world. Understanding the thirteenth moon and how it influences your life will shift your world view, adding a new dimension to your feelings about life and vastly increasing your self-understanding. When you understand the physical and ceremonial aspects of the Medicine Wheel and how this simple circle affects your life, you will be almost ready to do some powerful dancing. Before you begin you might wish to create some new tools to help you in your dance: pouches, jewelry, rattles, wands, staffs, shields, and masks. The ceremonies of creating these are another level of the wheel. With your new tools you are ready to dive from the springboard of the Medicine Wheel into the water of healing, both of yourself and of the earth. From healing ceremonies connected with the Medicine Wheel you will understand even more of the sacred circle of life and the power of the wheel. When we help people prepare to go to the earth to cry for their vision we always remind them that the vision is not just for themselves. A true vision is one that will benefit all of your relations on the Earth Mother, not just humans but all the beings in all the kingdoms. When you have experienced enough of the Medicine Wheel to truly understand your power for healing you are ready to go to the second section of Dancing with the Wheel. In this section we turn our attention to each of the kingdoms with which we share the earth. Because so many of us live in environments where we spend most of our time with people we need to familiarize ourselves with the representatives of the mineral, plant, animal, and color beings honored as part of the Medicine Wheel. From knowledge about these beings and how they connect with the wheel you will learn how to gain respect for all of our relations on the earth and learn both how to heal and be healed by these other children of the earth. The Mineral Wheel, the Plant Wheel, the Animal Wheel, and the Color Wheel are all critical layers of the Medicine Wheel. By looking at each one separately you will gain a naturalist's appreciation and a healer's understanding of your relations in each of these kingdoms. To make the healing energies of the wheel readily accessible during times of distress Dancing with the Wheel concludes with quick reference charts for the mineral, plant, animal, and color wheels; a listing of different states of human imbalance; and the proper place on the wheel to go to seek balance. Most chapters of the book contain exercises to help your understanding of the wheel surpass the intellectual. Although a mental knowing will increase your ability to dance with the wheel, true mastery will only come when you can feel this knowledge, not just think it. Each exercise begins with a list of items you will need and an estimation of the minimum time required. Because it is impossible to read and do the exercise at the same time, you might wish to record the exercise and then follow from the recording. Tapes are also available to guide you through the exercises. More information about these is included at the end of the book. 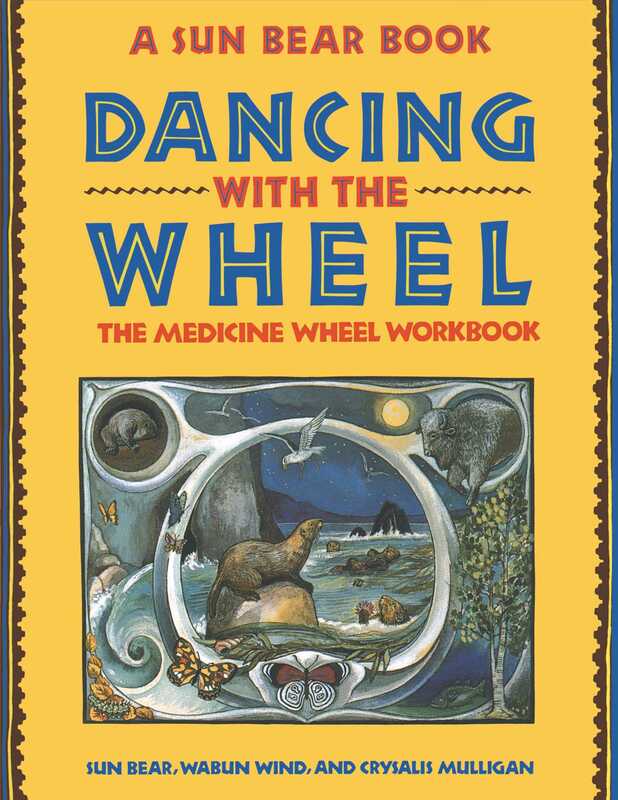 Dancing with the Wheel is a comprehensive guide to the Medicine Wheel and to ways in which you can personally help to create a beautiful, balanced world. You will gain the most benefit from this book if you read it in its entirety first, then return to the beginning and reread the chapters and do the exercises in the order in which they appear. Remember the reference charts in part II if you need help quickly. Sun Bear The Medicine Wheel Is a Springboard of Power that Will Allow You to Link Up with All the Energies of the Universe. Tom Brown, Jr. Director, The Tracker School, author of The Tracker, The Search, and The Field Guide to Wilderness Survival I sincerely believe that if more people would come into the circle of Sun Bear's vision it would be the saving of the world. I give him, his vision, and his books my fullest support. Dr. Elisabeth KÜebler-Ross author of On Death and Dying Sun Bear is a proud example for the generations to come. Page Bryant author of The Earth Changes Survival Handbook During these times of great change, Sun Bear's vision seems particularly appropriate.